See the world from a different perspective! By Amanda Delaney, Mark Neiswender and Brian Whitley of Weather Routing, Inc. This region is marked by two distinct “seasons”, both monsoonal seasons (as an aside, it is often a common misconception that monsoons are defined as weather regimes that are strictly related to heavy rain and moisture, but in fact, the word monsoon actually refers to a seasonal change in dominant wind direction). The northeast monsoon develops during late October and continues through early March, gradually becoming more intermittent. Later in the year, typically in April, we begin to see more intermittent S-SW winds associated with the Southwest Monsoon, though the Southwest Monsoon season really is in “full swing” during the period from mid/late May through early October. Several weather features are responsible for the development and transition of the monsoons. The equatorial trough (low pressure) climatologically resides from 05N to 10S and from 50E eastward across the southern Maldives to Sumatra and western Indonesia. This trough is usually defined by numerous showers and squalls moving westward from Sumatra and western Indonesia, and changes little in strength, while the trough itself remains quasi-stationary throughout the year. However, the trough does have a tendency to be a few degrees farther north in the summer, and a few degrees farther south in the winter. From late October through March, a strong arctic high becomes established across much of northern Asia. An associated ridge of high pressure builds across the northern Arabian Peninsula to the Bay of Bengal, and allows cold air to rush southward. This, in turn, produces enhanced north-northeast winds across the northern Indian Ocean when this ridge interacts with the equatorial trough (see Figure 2A). These north-northeast winds are usually strongest across the Bay of Bengal and Arabian Sea (east of the Gulf of Aden) with winds of Beaufort Force 5-7 and swells of 9-13ft. However, during December through February sustained gale force winds can develop in these regions when the arctic high is usually strongest. Beaufort Force 7-8 winds and swells reaching 11-16ft are not uncommon during these cases. Also, the Somali coast and Gulf of Mannar are prone to funneling winds, likely sustained Beaufort Force 6-7. Winds and swells gradually ease farther south and closer to the equatorial trough. The tropics allow for winds to shift out of the east and range from Beaufort Force 3-5. Swells in this vicinity are usually out of the east at approximately 5-8ft. By April through early May the arctic high over northern Asia weakens and the equatorial trough begins to migrate farther south. In this time, the northeast monsoon slowly weakens and winds shift to the south-southwest. 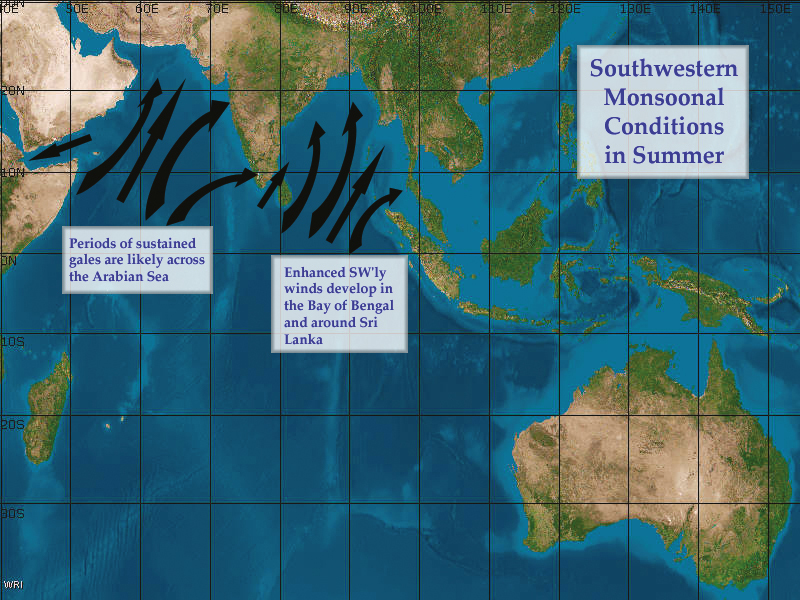 At the end of May, the winds strengthen from the south-southwest starting the southwest monsoon (see Figure 2B). 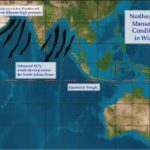 Southwest winds are strongest from the coast of Somalia eastward several hundred miles to approximately 65E, as well as from southeastern India and Sri Lanka eastward across the Bay of Bengal. Winds are generally from the south-southwest of approximately Beaufort Force 5-7 and swells 8-12ft across the Bay of Bengal. However, southwest winds will funnel across the Gulf of Mannar and become more westerly along the southern coast of Sri Lanka of force 6-7. The coast of Somalia consistently will have the highest winds (Beaufort Force 8-9) and building swells (15-20ft) during June through August. Winds are usually lower south of 5N, generally coming from the west at approximately Beaufort Force 4 or less and swells become westerly 4-7ft. By late September through October the southwest monsoon gradually weakens, becoming intermittent and eventually transitioning to the northeast monsoon by the end of November. The monsoon does influence other regions outside of the northern Indian Ocean as well. 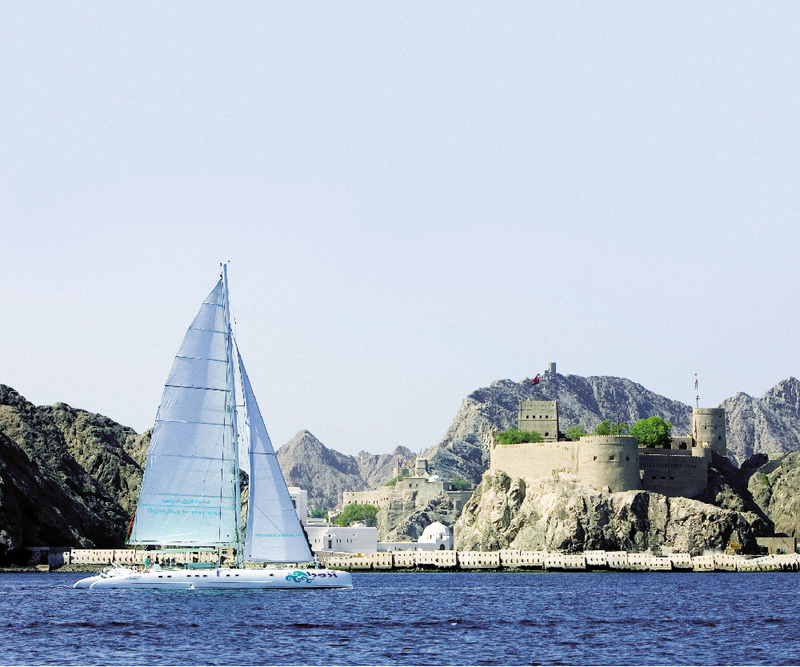 Across the Gulf of Aden winds are generally from the northeast and east of Beaufort Force 3-5 and swells 4-7ft during the winter. During the summer, the winds shift to more east and southeast of Beaufort Force 4-6 (with the highest winds occurring over the extreme western gulf) and swells 5-8ft. 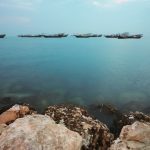 However, within 2-3 nautical miles from the Yemen coast, winds are generally onshore by day and offshore by night with the highest winds occurring during the late morning and afternoon hours year round. Winds funneling through the Strait of Malacca switch directions during the transition of the monsoons, like everything else in the north Indian Ocean. During the northeast monsoon, winds are generally out of the north and northwest of Beaufort Force 3-5. 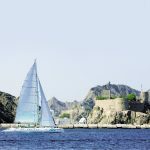 Swells generally subside through the strait, with heights generally from 3-6ft. Winds shift to more south and southeast of Beaufort Force 3-5 during the southwest monsoon and swells are generally 3-5ft. Winds are typically more variable and lighter year round, especially near the southern entrance of the strait, due to its proximity to the equator. As the southwest monsoon becomes established in April and May, the threat for tropical cyclones increases across the northern Indian Ocean. The tracks and frequency of tropical cyclones differ across the Arabian Sea and the Bay of Bengal. 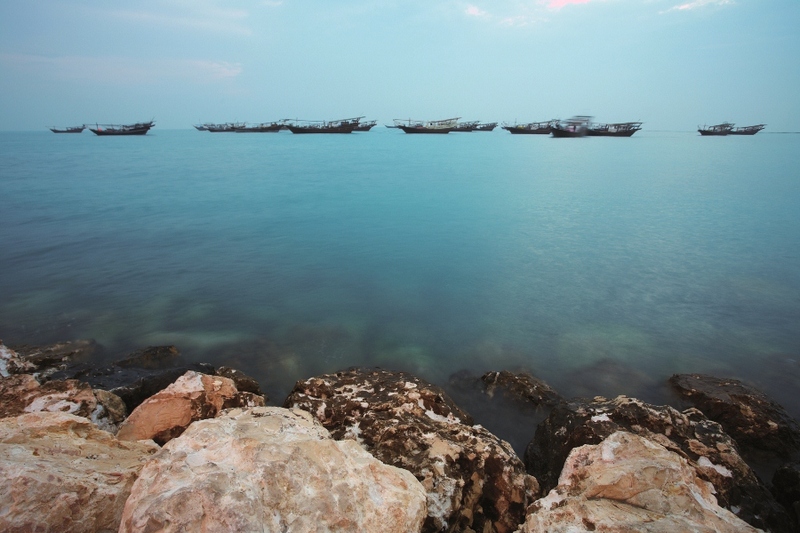 In the Arabian Sea, the tropical cyclone season usually begins in May and lasts through October. Tropical cyclones generally develop off the southwest coast of India. Once development occurs, one of two tracks will normally occur: either to the northwest to north-northwest, toward the northern Arabian Sea; or west to west-northwest towards the Arabian Peninsula. There are times when a tropical cyclone tracks from the Bay of Bengal across central or southern India and re-intensifies once emerging offshore the western Indian coast. The peak in the tropical cyclone season occurs at the end of May through June and again in October. However, tropical cyclones develop less frequently across the Arabian Sea averaging only 1 to 3 systems a year. The tropical cyclone season across the Bay of Bengal begins in April and continues through December. The peaks in the season occur in May and November during the transition between the southwest and northeast monsoons. Tropical cyclones usually develop in the southeastern Bay of Bengal (north of approximately 4N) and track either north to northwestward towards Bangladesh or west to northwestward to the eastern coast of India. Overall, the Bay of Bengal generally spawns 3 to 5 tropical cyclones a year. 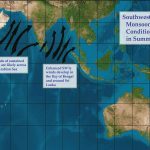 As far as ocean currents are concerned, in the Northern Indian Ocean the currents are dominated by the overall monsoonal pattern. 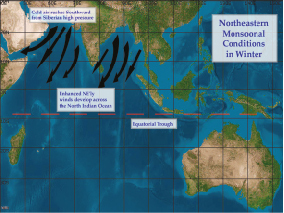 During the southwest monsoon, the strong southwesterly winds along the eastern Africa Coast thru the Arabian sea drive the current north-northeastward into the Arabian sea, turning eastward, then southeastward along the eastern Arabian Sea, then eastward along and north of the Equator to Indonesia. During the Northeast Monsoon, currents tend to be weaker. Weak clockwise circulations dominate both the Arabian Sea and Bay of Bengal. The northern Equatorial current develops along and just north of the Equator to 05N, running from east to west. Just south of the Equatorial current a counter-current develops between the Equator and 05S that runs in the opposite direction from west to east toward the North Australian Basin. This current will then tend to merge with the Leeuwin current, then moving southward along the Western Australian coast. The current within the Leeuwin can be relatively strong with an average speed of 1-2kts and as high as 3.5kts recorded. Shop 4, 35 Terry Street, Rozelle, NSW 2039 Australia. Site by Ocean Media, Australian Superyachts and Ocean Media.